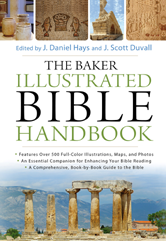 The Baker Illustrated Bible Handbook offers the most up-to-date evangelical biblical scholarship in a format that is colorful, informative, and easy to understand. What Is the Pentateuch About? What Are the Wisdom Books About? Where Does the Book of Psalms Fit In? Ecclesiastes: What Is the Meaning of Life? What Is a Gospel? And Why Are There Four Gospels?